Processing a large volume of trucks through your facility each day can be a challenge. When vehicle weighing transaction times increase, an entire operation can feel the effects. A small change can make an incremental improvement in processing time and help many facilities generate more revenue. Each time your scale weighs a truck there are steps in the process. Often this can include the driver exiting the truck and going to the scale house to see readings and interact with the scale operator. Not only is this likely to slow operations down, it is cumbersome for drivers. This interaction can be improved by streamlining communication with drivers. 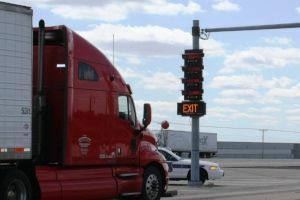 Remote scale displays and radio communication can keep drivers informed from inside their vehicles. This creates a more ergonomic process for drivers, and keeps traffic moving by not requiring them to exit their vehicles. Numerical displays can show real-time weight registered by the scale. Traffic lights and gates can also be used to automatically direct traffic. This allows drivers to focus on safely and swiftly transporting goods and materials in and out of your facility. METTLER TOLEDO offers an extensive line of vehicle scale accessories to help you manage weighing and traffic operations. Contact us for a site evaluation to see how we can simplify your operation.